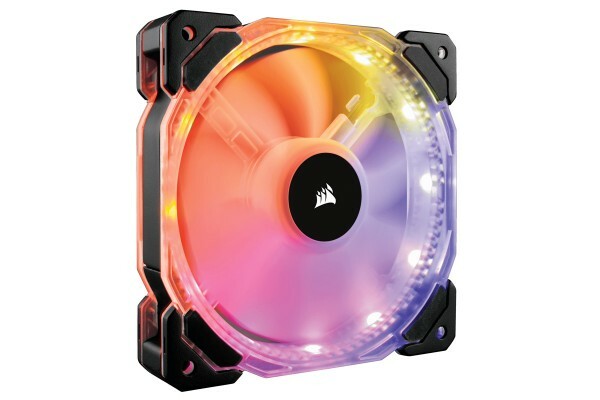 The CORSAIR HD120 RGB LED PC-case fans combine 12 independent frame-mounted RGB LEDs with excellent airflow and create a stunning effect in your system. Use the readily accessible 3-key controller to create amazing effects with your fans - with dimming, pulsing, blinking, and other LED modes. The HD120 RGB LED fans are custom-built for users who want their system to outshine all others. Each of the 12 RGB LEDs, which are integrated into the frame, is fully customisable. This opens up nearly endless customisation possibilities and light effects. Navigate light effects, speeds, and individual RGB LED colours. Ensures improved performance compared to standard case fans. Ultra-thin fan blades create fewer vibrations, noise, and turbulence. With 12 independent LEDs and 7 unique illumination modes, the HD120 offers countless light effect combinations for you to discover. Select a theme that matches your system, or pick a more flamboyant effect - it's your choice.